GCC region has been known as the oil producing region, but with the expected decline in oil market in future, the region is witnessed to shift their focus to other economic developmental activities such as construction projects at a large scale. By 2016, statistics show that the region has spent nearly USD 130 billion on the construction projects and the total value of active projects is nearly USD 2.6 trillion. Thus, the huge construction industry of GCC region is driving the growth of construction chemicals market by manufacturing, demand and supply. Materials are the building block of the construction industry and construction chemicals is one of them. Continuous advancements in the construction chemicals are witnessed in order to improve the strength, longevity, durability and holding and joining features such as adhesives and construction chemicals and concrete admixture. GCC chemical industry is one of the oldest industries in the region, with highest growth rates shown in Saudi Arabia followed by Kuwait, Qatar and Oman. Further, there are certain challenges faced by the construction chemicals industry related to adverse environmental impacts. Chemicals used in the construction activities react with the environmental gasses which is harmful for the living beings over the long period of time. Goldstein Research analyst forecast that the GCC construction chemicals market is set to reach nearly USD 15.32 billion by 2025, growing at a CAGR of 4.9% over the forecast period (2017-2025). Commercial construction segment acquired largest market share of 43.7% in 2017 on the back of large construction projects taken up in the region that some of the sites have achieved top position in global ranking. Commercial construction is followed by industrial construction, growing at a CAGR of 5.0% over the forecast period. Based on geography, Saudi Arabia region accounted for largest market share of 27.4% in 2017 followed by UAE, Qatar and Oman. The rising investments in infrastructure, tourism and other industries on the back of declining oil and gas industry in future are increasing the application of construction chemicals in the region. The report covers the present ground scenario and the future growth prospects of the construction chemicals market for 2017-2025 along with the market players’ analysis. We calculated the market size and revenue share on the basis of revenue generated from major players in the GCC region. GCC Construction Chemicals Market Report 2017-2025, has been prepared based on an in-depth market analysis from farm market experts. 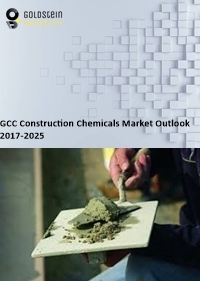 The report covers the competitive landscape and current position of major players in the GCC construction chemicals market space. The report also includes porter’s five force model, SWOT analysis, company profiling, business strategies of market players and their business models. “GCC Construction Chemicals Market Report” also recognizes value chain analysis to understand the cost differentiation, pricing models to provide competitive advantage to the existing and new entry players. Our GCC construction chemicals market report comprises of the following companies as the key players: BASF, Henkel, H.B. Fuller, Sika, 3M, Dow, Hernon Manufacturing, Pidilite, Construction Material Chemical Industries (CMCI), Al-Jazea, etc.